When you manage your shareholdings using Barchart's free Portfolio tool, you can also see a snapshot of all your Portfolios. 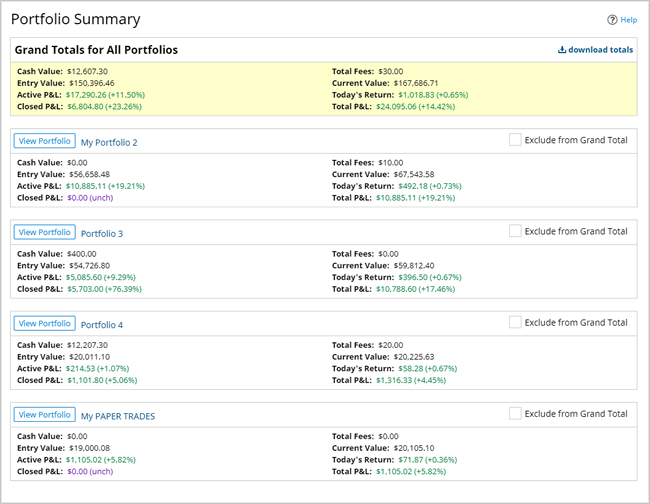 The Portfolio Summary page provides a grand total for all of your Portfolios. You may exclude one or more portfolio totals from being adding into the grand total by checking the appropriate boxes. Totals are calculated using the latest delayed prices available. Stocks: 15 minute delay, ET. Futures and Forex: 10 or 15 minute delay, CT. Portfolio totals also will exclude Futures and Forex figures from the Entry Value and Current Value fields, as this information does not apply to these asset classes. Entry Value = Cash + Sum of ( Entry Price * Quantity + Commission ) for all items. Excludes Futures and Forex. Total Fees = Sum of Fees for all transactions. Current Value = Cash + Sum of Last Price (Exit Price for closed positions) * Quantity for all transactions. Excludes Futures and Forex. For Sell transactions, the calculations are reversed, so that the Current Value is calculated from the Entry Price, and the Entry Value is calculated from the Last Price (or Exit Price for closed positions).